Incredible '86 Fleer Basketball wax box on the auction block this month. The '86 Fleer Basketball issue is perhaps the most popular and important productions ever created. The offered box is an extraordinary one and ranks as perhaps the finest '86 Fleer box in existence. The contents within have been examined and authenticated by hobby expert Steve Hart at BBCE. This box comes with a letter of authenticity from Steve Hart stating that within this box is a pack that contains the all important #57 Michael Jordan rookie on top. This pack is 7th down on the left stack. This particular pack also contains the #1 Kareem Abdul-Jabbar Sticker on the reverse (incredible pack!!). 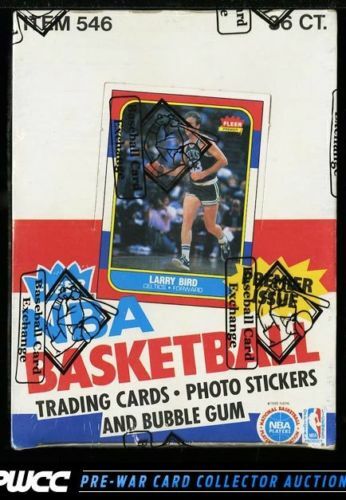 Four Fleer Stickers show of Larry Bird, Adrian Dantley and Alex English while the other 8 players from the issue have three examples of each present. Many key rookies and HOFers the likes of: Michael Jordan, Dominique Wilkins, Charles Barkley, Patrick Ewing, Chris Mullin, Hakeem Olajuwon, Isiah Thomas, Kareem Abdul-Jabbar, Magic Johnson and Johnny Moore are held within. All in all this is a premier offering and is only deserving of the best collection in the hobby. Please see the scans for more details. Enjoy! One of over 15,000 cards, lots, and sets up for bid in our 8th Auction of 2016. Click on the link above to view the other PWCC auction lots.